China is known for many things, but for currency collectors around the world, the culture is known for being a pioneer in paper cash notes. 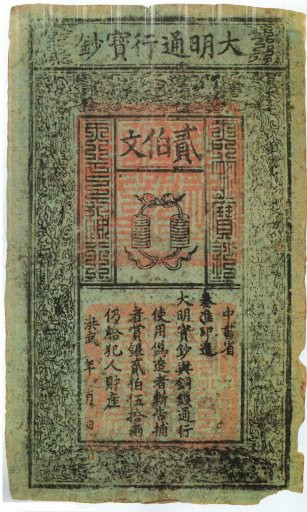 The Ming Dynasty is known for having some of the most unique and interesting paper money in the history of ancient currency. Previous Chinese Dynasties such as the Yuan and Ch’ing focussed the currency of their economies on copper and silver coins, the Ming Dynasty introduced Chinese paper cash notes into circulation in 1374. The notes were referred to as “Ta Ming T’ung Hsing Pao Ch’ao” (Great Ming Precious Notes) and they were printed at what was known as the Precious Note Control Bureau. During the time, Emperor T’ai-tsu used the title of Hung-wu, early Ming Dynasty notes featured references to the dynasty’s founding. It’s estimated that there were sixty different Chinese paper cash notes issued from 1368-to-1426, and it’s highly likely that there are more. Ch’eng-tsu paper money was influenced by the inflation happening in the kingdom at the time and bank notes had denominations of 1 through 20 kwan, 25, 30, 35, 40, 45 and 50 kwan. The notes featured stunning designs showcasing scenes with clouds and dragons, all images were a grey colour. Chinese currency saw a shift after the passing of Jen-tsung shortly after taking the throne, within a few months of the Emperor’s death, twenty different denominations were eliminated from circulation. Notes started with denominations of ten cash and then grew in value by tens to 100 and by hundreds to a value of 1,000 cash. These notes are referred to as Great Ming Administration Treasury Notes. Eventually, the value of these notes decreased to the point where Chinese citizens stopped accepting them. At the end of the century, it would take 35 strings to purchase an ounce of silver, the same ounce would cost 80 strings just twenty years later. The rapid decrease in the value of paper notes meant an ounce of silver commanded over 1,000 strings during the mid-1400s, silver was quickly replacing paper money as currency during this time. Paper money would eventually disappear from the Chinese economy. During the last year of the Ming Dynasty (1643) a memorial was sent to the emperor with a proposal to reinstate the use of paper money in the kingdom. This memorial included ten reasons why paper money should be used again. This proposal was not accepted and the Chinese would not use paper money for another 400 years. Chinese Paper cash notes from the Ming Dynasty are highly regarded by currency collectors from around the world and have excellent value and can found in many museum and private collections. Not only do these notes display stunning artwork, but they are souvenirs from an interesting and important time in Chinese history.